This is Alyssa and Jacob. They are my friends’ Kristy and Jake’s kids and just… adorableness. I created that word. Jacob is my godson and I sort of want to eat him up. After he ate this cookie, he jammed out to his favorite song. I’m just gonna sit here and watch this for the rest of my life. 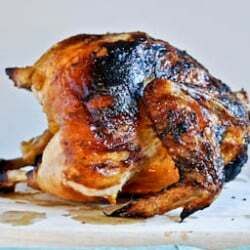 Brown Sugar Butter Roasted Chicken. Oh mah gawd. I can’t believe this is making me want children. Hahaha looks like he is off to the right start when it comes to musical tastes. ;) Reminds me of the time I first heard the song “Low” from a 4-year-old. I just fainted. And my ovaries just expanded to the size of Dallas. That is the cutest thing I have ever seen! :) Too funny. Definitely brought a smile to my face!! Oh my GAWD he has a future! Either in dance or hip hop or music in some kind of way. You can’t fake natural rhythm. OMG – that little Jacob is so stink’n adorable!!!! So adorable! Looks like a fun day at the pool! He dances better than I do. Too cute! hahahahahah OMGGGGGG that is the most amazing thing, upload it on youtube he could be the new sensation!!! awesomeness! so super cute. love your blog. might be a little partial to the sugary goodness too. That is SO adorable! I agree – I could eat them up! These look fantastic! I can’t wait to try these! Thanks for sharing! Yikes! Wrong place! LOL The kids are so Cute!! When I saw the names I did a double take. My name is Alyssa and my brother is Jacob. Excellent names :) And they’re adorable. So, I read your blog like an addiction. I work nights as a pediatric nurse and when I have a break, I click thru the links at the bottom of your posts. Found this older one and would like to know if anyone has asked Chris Brown where he really got his moves from?… I mean, really? This kid is killin’ it!